Let me share with you a reason why you should continue to rebound consistently and daily for the rest of your life. Several weeks ago, The Journal of the American Medical Association published a study that should give pause to anyone who plans to live a long and independent life. The study looked at the incidence of hip fractures among older Americans and the mortality rates associated with them. The study found that the 12-month mortality rate associated with the injury still hovers at more than 20 percent, meaning that, in the year after fracturing a hip, about one in five people over age 65 will die. Meanwhile, another group of articles, published as a special section of Medicine and Science in Sports and Exercise, in the Journal of the American College of Sports Medicine, underscored why that statistic should be relevant even to active people who are years, or decades, away from eligibility for Medicare. The articles detailed a continuing controversy within the field of sports science about exactly how different exercises work on bone and why sometimes, apparently, they don't. Dr. Daniel W. Barry, an assistant professor of medicine at the University of Colorado, at Denver said "There was a time, not so long ago," when most researchers assumed "that any and all activity would be beneficial for bone health." He is a researcher who has studied the bones of the elderly and of athletes. He had to readjust his research when a group of unexpected findings, some showing that competitive swimmers had lower-than-anticipated bone density, competitive cyclists sometimes had fragile bones and, finally, that weight lifting did not necessarily strengthen bones much. In one representative study from a few years ago, researchers found no significant differences in the spine or neckbone densities of young women who did resistance-style exercise training and a similar group who did not. Researchers readily admit that they don't fully understand why some exercises are good for bones and some just are not. As the articles in Medicine and Science in Sports and Exercise make clear, scientists actually seem to be becoming less certain about how exercise affects bones. Until fairly recently, many thought that the pounding or impact that you get from running, for instance, deformed the bone slightly. It bowed in response to the forces moving up the leg from the ground, stretching the various bone cells and forcing them to adapt, usually by adding cells, which made the bones denser. But many scientists now think that that process doesn't apply to bones. "If you stretch bone cells" in a Petri dish, says Alexander G. Robling, an assistant professor in the department of anatomy and cell biology at Indiana University School of Medicine and the author of an article in Medicine and Science in Sports and Exercise, "you have to stretch them so far to get a response that the bone would break." So he and many other researchers now maintain that bone receives the message to strengthen itself in response to exercise by a different means. He says that during certain types of exercise, the bone bends, but this doesn't stretch cells; it squeezes fluids from one part of the bone matrix to another. The extra fluid inspires the cells bathed with it to respond by adding denser bone. Why should it matter what kind of message bones are receiving? Because, Professor Robling and others say, only certain types of exercise adequately bend bones and move the fluid to the necessary bone cells. An emerging scientific consensus seems to be, he says, that "large forces released in a relatively big burst" like landing on a rebounder are probably crucial. The bone, he says, "needs a loud signal, coming fast." How about one hundred times a minute? For most of us, weight lifting isn't explosive enough to stimulate such bone bending. Neither is swimming. Running can be, but the runner has to put up with the continuous shock of the feet hitting a hard surface which could be very damaging. 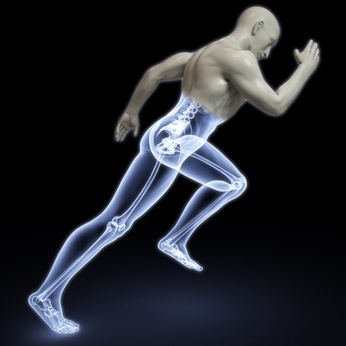 Although for unknown reasons, running doesn't seem to stimulate bone building in some people. There seems to be a plateau, however, that has also surprised and confounded some researchers. Too much endurance exercise, it appears, may reduce bone density. In one small study completed by Dr. Barry and his colleagues, competitive cyclists lost bone density over the course of a long training season. Dr. Barry says that it's possible, but not yet proved, that exercise that is too prolonged or intense may lead to excessive calcium loss through sweat. The body's endocrine system may interpret this loss of calcium as serious enough to warrant leaching the mineral from bone. Dr. Barry is in the middle of a long-term study to determine whether supplementing with calcium-fortified chews before and after exercise reduces the bone-thinning response in competitive cyclists. He expects results in a year or so. 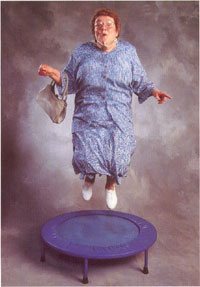 In the meantime, the current state-of-the-science message about exercise and bone building may be that, silly as it sounds, the best exercise for osteoporosis is to simply jump up and down on a rebounder, for as long as the downstairs neighbor will tolerate. Rebounding increases the G-Force loading on every cell of the entire body about one hundred times a minute. That means that every cell; skin, muscle cells, ligaments, cells of vital organs and even the bone cells have to adjust to an increased G-Force. "Jumping is great, if your bones are strong enough to begin with," Dr. Barry says. Or if you are landing on a soft surface. "You probably don't need to do a lot either." In studies in Japan, having mice rebound, or jump up and land 40 times during a week increased their bone density significantly after 24 weeks, a gain they maintained by hopping up and down only about 20 or 30 times each week after that. Of course, we are not mice. We are more complicated, so rebounding twenty minutes a day seems to answer our needs for increasing bone density. If hopping seems an undignified exercise regimen, bear in mind that it has additional benefits: It tends to aid in balance by stimulating the vestibular system, the proprioceptors and the antigravity muscles, which may be as important as bone strength in keeping fractures at bay. Most of the time, Dr. Barry says, "fragile bones don't matter, from a clinical standpoint if, because of better balance, you don't fall down." So Al Carter presents some pretty good evidence for his case that the best exercise for osteoporosis is rebounding. Our amazing bodies are designed to adapt to the conditions we subject them to. Often, it is "use it or lose it." If you don't use your muscles and bones, your body puts less of its resources into them and you begin to lose function. For more information about osteoporosis visit the page about how to treat osteoporosis naturally. For more information about rebounders and their many benefits see the page that describes rebounder exercise.